You want to speed up Firefox. 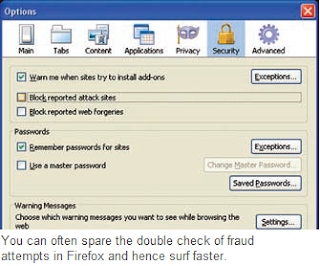 For this, you can switch off the automatic fraud protection of the browser. In order to gain more efficiency from the browser, you can close the phishing protection of Firefox. Because if you have a complete security suite like Norton or Kaspersky installed in your system, than that is already protecting you against phishing. So having Firefox’s phishing filter activated will not be of mush consequence. For turning off the phishing filter of Firefox, go to “Tools | Options”. Here click on the security option and here deactivate the options “Block reported attack sites” as well as “Block reported web forgeries”.